* Drawing on a wide range of material, ranging from the spiritualities of the world religions to the findings of contemporary neuroscience, Karen Armstrong argues that compassion is hardwired into our brains, yet is constantly pushed back by our more primitive instincts for selfishness and survival. Since time immemorial religion has enhanced our altruistic tendencies: all faiths insist that the Golden Rule is the test of true spirituality u 'Always treat others as you wish to be treated yourself'. 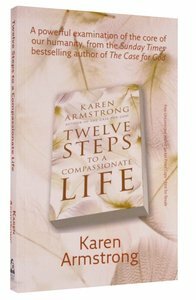 * Taking as her starting point the teachings of the great world religions, Karen Armstrong demonstrates in twelve practical steps how we can bring compassion to the forefront of our lives. These steps both reveal the inadequacies of our knowledge of ourselves and others and enable us to unlock our potential for understanding, empathy and altruism that can be translated into acts of kindness and charity.They culminate in the most radical and challenging of all religious maxims u love your enemy. Yet in today's world, compassion in no longer a luxury but, in the words of Martin Luther King, 'an absolute necessity for our survival'. * Practising these steps will not change our lives overnight and turn us into saints or sages: the attempt to become a more compassionate human being is a lifelong project. Yet Karen Armstrong argues that compassion is inseparable from humanity, and by transcending the limitations of selfishness on a daily basis we will not only make a difference in the world but also lead more fulfilled, happier lives. About "Twelve Steps to a Compassionate Life"